Nobody is more qualified to tell you and me how to use a brand new bass lure than the guy who created it. That's why my ears and eyes came to full attention recently when I had a chance to visit with Phil Marks, a bass fishing Texan who is the designer of a new crankbait that's now being marketed by the Strike King Lure Company. I told you about Marks in my last column. I was especially interested in talking to him now because that new crankbait he came up just might be bigger than anything else you now have in your tackle box. Phil's new 10XD is a diving crankbait that's a full six inches from its long diving bill to its tail. It weighs nearly 2-ounces. As you'll soon discover if you get a chance to visit with Phil is that a whole lot of thinking went into creation of this lure before it ever hit the drawing board. Here's a close up of the new Strike King 10XD diving crankbait. For starters, remember that Phil Marks is every bit as deeply hooked as the rest of us who fish for bass. 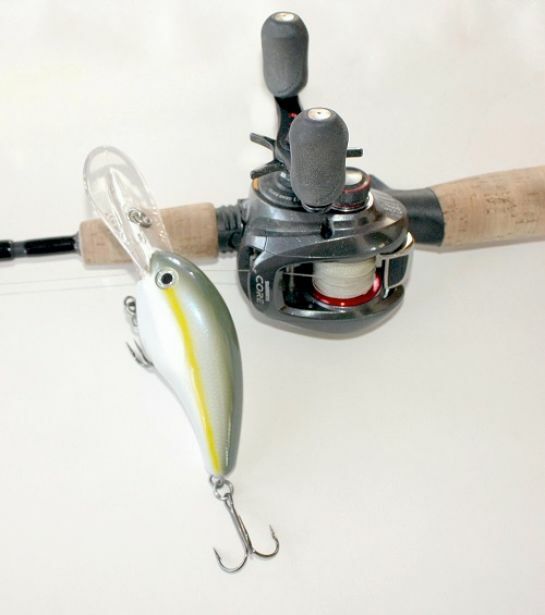 "I wish I'd come up with this new lure 15 years ago," he says. "I started thinking about it seriously about seven years ago. We finally started working on it in 2011and I was still tweaking things here and there in the spring of last year." Marks does a lot of his fishing in Texas. As anybody who has fished the Lone Star State much know, there is an abundance of sizeable largemouth in that part of the word. "I wasn't worried about the bass being able to eat the 10XD," he says, "I'd seen them spit up stuff larger than the lures we throw at them." Phil Marks has used his new 10XD crankbait successfully under tough tournament conditions. What Marks says about actually fishing the big new Strike King crankbait ties right in with my personal bass fishing experience over the past half century. Much of my own bass fishing has been done in the Pacific Northwest. Oregon and Washington aren't renowned for the big bass they produce but I've taken my share of fish in the tall timber country running between eight and nine pounds. And I'm telling it like it was when I say those fish didn't come often but when they did they usually came on just a couple of my largest lures. Much of what Phil told me simply confirmed my own bass fish beliefs. Sure he's proud of his new 10XD and he's already taken a couple of fish that topped 10-pounds on it. But the first thing he'll tell you is that like the other lures you've got in your box, this big new isn't "always" going to get fish. Once again his comments tie right in with my own thinking. If you've been reading my material for more than the past half century you know I've said a few hundred times that the word "Always" should be eliminated from a bass angler's vocabulary. Largemouth bass don't always do anything. Replace that always word with "Often" or "Sometimes" and you're headed in the right direction. "You must have realistic expectations," Marks says. "Big bass often aren't as aggressive as smaller fish. You've got to be sure you're getting a lure the 10XD down where they are and you'll find you need the right line weight and a rod that lets you handle a lure of its size." Anglers who've used this new big crankbait say they're surprised that it's as easy as it is to retrieve despite its size. So what kind of rod does this likeable tournament winning pro and lure creating expert favor in the way of rods? "I favor an 8-foot light action rod," he says, "that was originally designed for fishing swim baits. I found that I just wasn't comfortable using it on a rod I'd normally use for crankbait fishing." The main thing that stands out where Phil's actual retrieve tactics are concerned is that he wants his 10XD working its way right down there along the bottom. "That long rod makes it easy to make long cast and get down deep," he says, "if that's what's required. I'm a believer in a fast retrieve. I make contact with the bottom and I make sure to bounce it off anything the lure encounters as I bring it back to the boat." Here's another view of the new Strike King crankbait that's getting lots of attention from anglers going after big bass. Marks usually loads his reels with fluorocarbon lines running from 10 to 15-pound test. He changes line test if that's what required to make the desired contact with the bottom on the retrieve. Does Texas sharpshooter have a favorite color in the big 10XD? Yes he does. 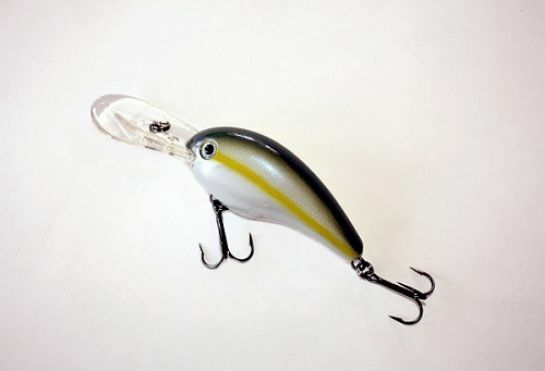 Like the expert he is, he won't stick to a single color if it doesn't produce but his number one choice is a shad pattern in chartreuse with a blue back. That's about the size of it. Those big brutes down there in their hidey holes might not feed all that often and can be really selective when they do. Now and then a lure maker comes up with something that turns them on. 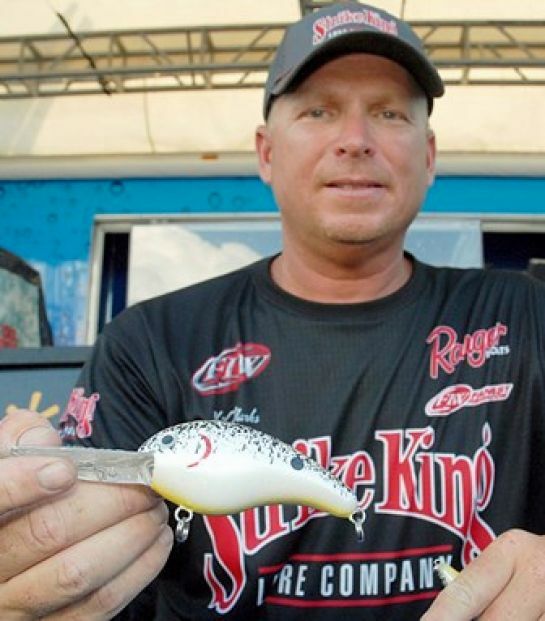 There's already ample evidence that Strike King's new 10XD does that. The first chance I get I'm fixin' to find out if it will work as well for me as it has for those plus pitchers down there in Texas. I'd love to climb into a bass boat with a guy named Phil Marks. Maybe you already know who Phil is. If you don't and you're into bass fishing big time I think you should. Phil, you see, is one of those talented dudes who spends most of his time coming up with the baits that you and I catch bass with. If you don't know Phil, I'd bet all of my Senkos you're well aware of the Strike King Lure Company. Among other things, Phil is the new products manager for this highly respected Tennessee based lure building operation. I don't care what lure you've tied on in the past 15 years, if it carries the Strike King label Phil Marks has had something to do with it. You don't have to stretch your imagination very far to appreciate the kind of knowledge a man gets to collect when he's spent the time doing what Phil has. Phil Marks doesn't just design fish catching lures for the Strike King Lure Company---he gets out there and uses them. 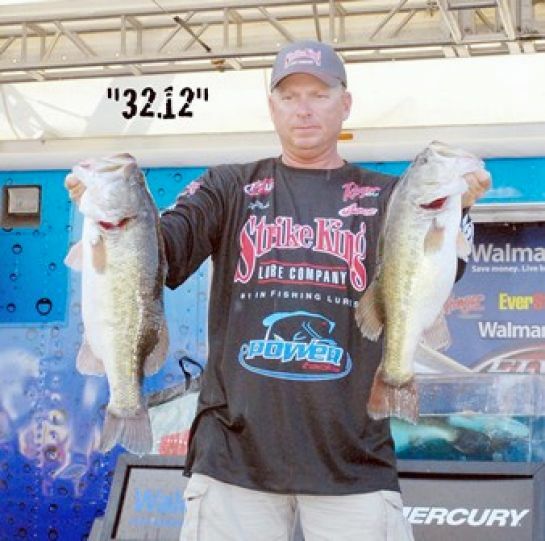 He won the FLW tour tournament at Sam Rayburn Lake where he nailed this pair of dandy largemouth. Marks has been in the sports fishing industry ever since after he got his degree in ocean engineering from Texas A&M back in the spring of 1990. I doubt he's ever done much engineering where our saltwater seas are concerned but he sure as the devil has left an imprint on this business of putting bass in the boat. That's why I started out this column by mentioning how much I'd like to I'd like to share a bass boat with him. I'm usually told I'm bringing too many rods and reels and other gear when I climb into somebody else's bass boat. Phil wouldn't have to worry about that if I got to go with him. I'd be perfectly content to leave my gear home and just spend the day taking full advantage of the wondrous opportunity to simply look, listen and learn. I know that the foregoing is true because not long ago I had a chance to spend some time visiting with this nationally known lure building expert. I'd talked to him briefly a couple of years ago at the annual ICAST show in Las Vegas. I caught up with him this last time when he just returned from a bass fishing tournament. Though I've known of Phil and the important role he plays with one of the nation's leading bass lure builders for a long time, I found my interest in him peaking again late last year when he flat clobbered the competition in a Walmart FLW Tour Open in which he participated at Sam Rayburn Reservoir down in Texas. When I say Marks "clobbered" the competition it isn't an exaggeration. 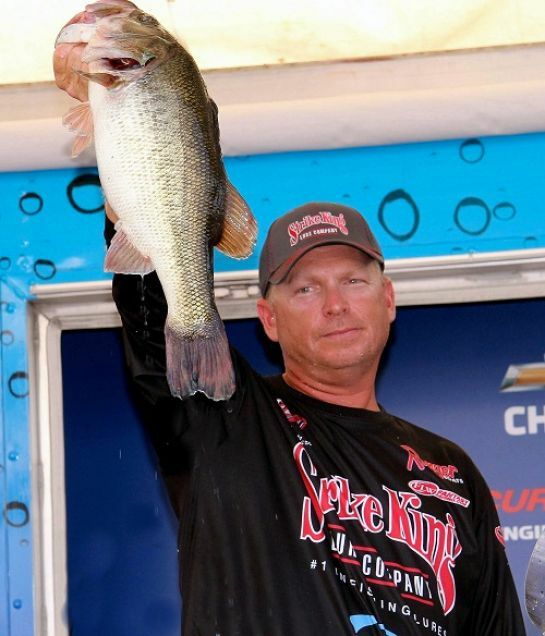 Phil wound up the three days of tournament fishing with a winning total of 82-pounds. In fact, his winning margin of 16.5-pounds was the fourth largest in Walmart FLW Tour history. The final day of the contest he brought in a five bass limit that weighed 32-pounds, 12-ounces. When a guy who builds baits does this sort of thing it's bound to get your attention. It sure as heck got mine. And the fact that he had he won it with such impressive totals wasn't the only reason. What else was there? Listen up---I'm about to tell you. That second reason for my keen interest was centered on one of the lures Phil used to catch his largest bass during the Big Sam tournament. That lure was a brand new Strike King lure that hadn't quite yet made it to market. That lure---it was the Strike King 10XD---is a deep diving crankbait that's probably bigger than any other crankbait you've now got in your tackle box. How big is it? Well, if you've checked it out since it did hit dealer shelves you're aware this big sucker is 6-inches in length and weighs nearly two ounces. The lure Phil Marks is holding is here is the new 10XD crankbait he designed for Strike King. He's already caught a couple of 10-pound laremouth on this new lure himself. Are you thinking that's way too big for the bass where you fish? Well, those fish down there at Sam Rayburn aren't nearly as smart as you are---they knocked the hell out of it! So did other bass of 10.2-pounds and 10.4-pounds that Phil himself has taken from other waters with this overgrown crankbait. "The largest fish I know that's been caught on it so far," Phil told me, "weighed 14-pounds." Now if fish that size don't get your attention I don't know what would. 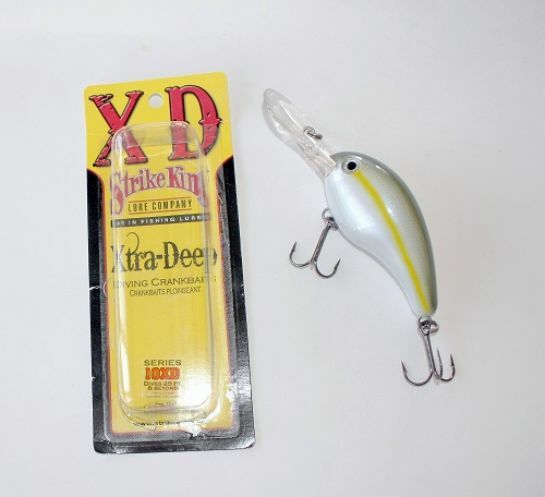 The new 10XD Strike King diving crankbait doesn't just interest bass. 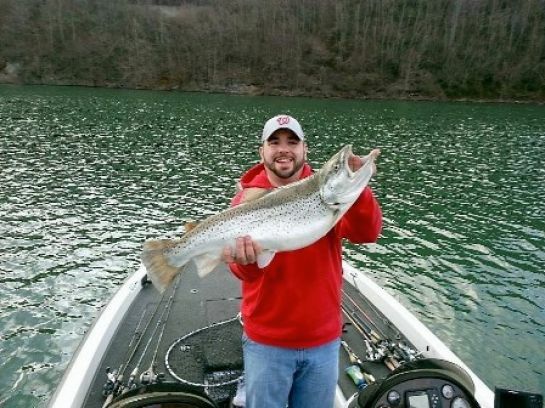 An angler named William Uzzelll used one to catch this big brown trout from a Virginia lake. This beauty weighed 12-pounds, 12-ounces. That's why just as soon as I could I got hold of the bait's creator to try and find out just when, where and how he fished it. Phil shared that information with me. Keep an eye on my next column here because I'm fixin' to share that same information with you.